PANAMA CITY, Panama — In 1854, a ship carrying Chinese workers, many from South China's Guangdong province, landed in Panama to work on the Panama Canal Railway. Their journey kicked off more than 160 years of exchange between the peoples of China and Panama, culminating in the signing of a joint communiqué on June 13, 2017, which formally established diplomatic ties between the two countries. To celebrate the one-year anniversary of China-Panama relations, the Guangzhou People's Government and China Daily invited more than 2,000 people to the local Chinese Cultural Center on Thursday for a special "storytelling event". 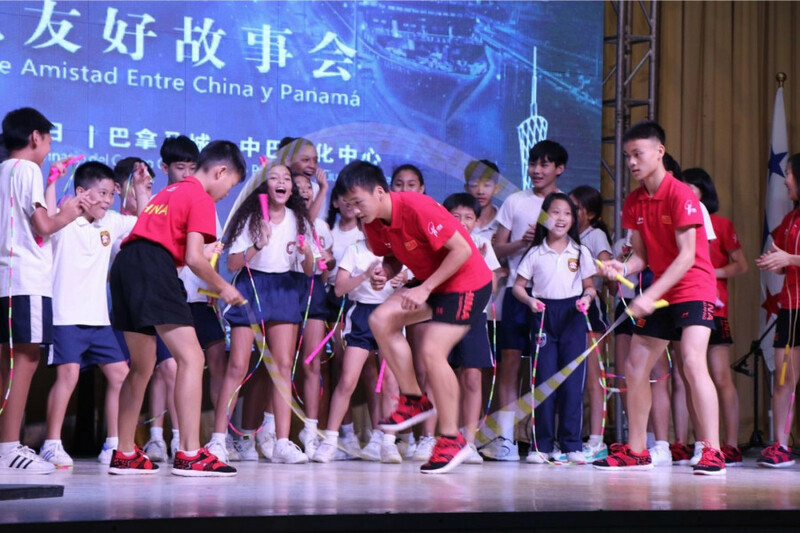 Through the sharing of stories, traditional folk dances and jump-rope performances by students, the event was aimed at creating a platform to enhance cultural exchange and educational opportunities, further testifying to the mutual interest in collaboration between China and Panama. More than 300,000 people of Chinese descent, or 10 percent of the total population, currently live in Panama, according to the Overseas Chinese Affairs Office of the State Council, but the Central American country's connection with China goes back to the Qing Dynasty (1644-1911). Dr Enrique Lau Cortés' paternal grandfather arrived more than a century ago from China to help construct the Panama Canal, an artificial waterway that connects the Atlantic Ocean with the Pacific Ocean. "Mutual understanding is the basis for friendly exchange between the people of the two countries," said Lau Cortés, whose mother is Panamanian and father Chinese. The current director of the Society of International Studies Panama said he was finally able to connect with his paternal relatives following the establishment of diplomatic ties between China and Panama. But when it comes to the struggle of Chinese Panamanians, no one understands it better than Liu Yanglie, a business owner originally from Huadu, a district in Guangzhou's northern suburbs. "In the 1980s, I just came to Panama; I was so poor, but I was very fortunate to work at the food wholesale company of my brother Liu Wenhui, who had been living and working in Panama," said Liu. After years of hard work, Liu accumulated experience and learned Spanish. He started his own beef store in 1985 and opened a Chinese restaurant in 1989. It's estimated that around 80 percent of the Chinese residents in Panama hail from Huadu, where some villages are nicknamed "Panama Village" due to the high number of locals who have migrated to Panama. Among performers is a special team of students led by Lai Xuanzhi, the first physical education teacher hired by Huadu's Qixing Elementary School, a rural area primary school. "I have always wanted to promote jump rope, so that sportsmanship could flourish around the world," Lai said. "Coming to Panama for educational exchanges makes my dream come true." Lai arrived in Panama from Guangzhou early this month, to teach at the Chinese Cultural Center for a month. He has led his jump-rope team from Qixing Elementary School to championships on national and international stages, he said. Although China and Panama have enjoyed a special bond due to the immigration history, the two countries also have collaborated closely in the economic realm in recent history. China is the second-largest client of the Panama Canal after the United States. 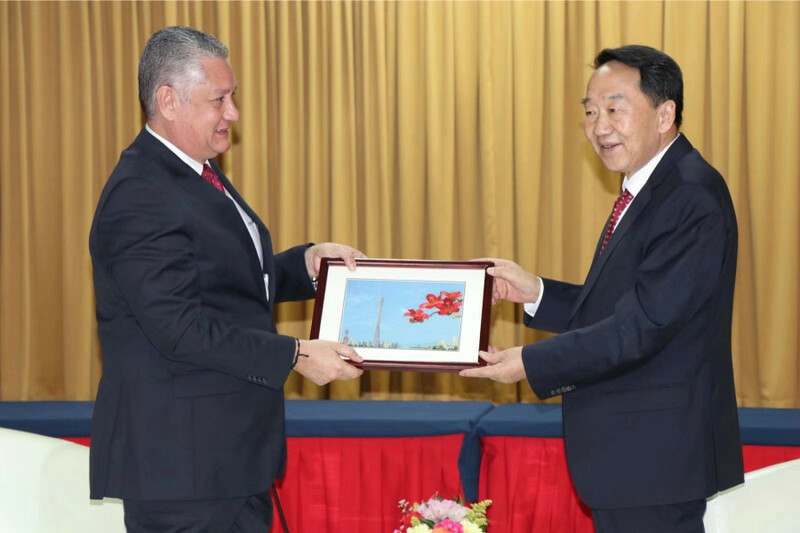 A number of Chinese companies, including Huawei, also have established their branches in Panama, known as the "hub of the Americas". On July 29, a group made up of China Communications Construction Co Ltd and China Harbour Engineering Co Ltd won a $1.42 billion contract to build the fourth bridge over the canal, according to Reuters. But many people expect more economic collaboration to follow after the forging of diplomatic ties between the two nations. "China and related countries are building an international platform of collaboration through the Belt and Road Initiative," said Jiang Jianguo, deputy head of the Publicity Department of the Communist Party of China and a keynote speaker at Thursday's event. He said Latin America is the "indispensable participant" in the development of the Belt and Road Initiative (BRI), and Panama is the Maritime Silk Road's "natural extension" into the region. The BRI, put forth by President Xi Jinping in 2013, seeks to create a trade and infrastructure network connecting Asian with Europe, Africa and beyond. Panama became the first Latin American country to sign up for the initiative, followed by Antigua, Barbuda, Trinidad and Tobago, and Bolivia. "The building of diplomatic ties between China and Panama would further enhance the logistics economy of Panama," said Leonardo Enrique Collado Trejos, an economist and professor from the University of Panama's Regional Center in Azuero. "China is a golden opportunity in Panama's diplomatic history."